2014: Second Workshop Reasoning About Other Minds, in Groningen. 2014: Co-organizer Studium Generale Series How to Build Your Own Cognition at the University of Groningen, on the occasion of 20 year anniversary of Artificial Intelligence in Groningen. Lectures were presented by Chris Eliasmith, Rolf Pfeiffer, Noah Goodman, and Luciano Fadiga. 2011: TARK XIII , the 13th Conference on Theoretical Aspects of Rationality and Knowledge, in Groningen. 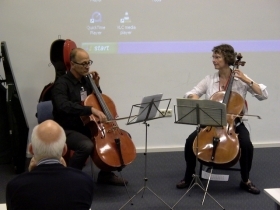 Each invited lecture at TARK XIII was accompanied by a thematic cello duet. Here you can listen to Hans van Ditmarsch and Rineke Verbrugge playing the first Largo from Vivaldi Sonata IV for violoncello and basso continuo, RV45, chosen as a prelude to the invited lecture by Larry Moss on Connections of Coalgebra and Semantic Modeling, on Wednesday, July 13, 2011.